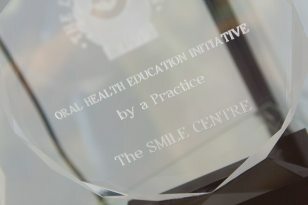 The Smile Centre team is passionate about giving patients the means and the motivation to smile at the world confidently. We believe that the foundation of a healthy smile is a good oral hygiene routine using the right toothbrushes and interdental cleaning products. Understanding that one size does not fit all, our fantastic team of hygienists is able to customise your oral care routines during your thorough 30-minute appointments by advising you on the best brushing techniques and health care products. Our hygienists are equipped with all the latest technology including intra-oral cameras. The cameras are fabulous educational tools that show you the inside of your mouth and help you to see where you perhaps don’t clean properly or the consequence of a poor oral hygiene routine. We also make good use of a superb system called Airflow; a jet polishing system ideal for removing stubborn stains caused by red wine, smoking, tea and coffee. Airflow treatment leaves your teeth feeling smooth and clean, and your mouth feeling very fresh.